I was looking for some inspiration for a Sunday night dinner, it had to be meatless, tasty and not too complex. I pulled out a cookbook, Fresh by Julie Biuso, and would have made just about all of the recipes, but had to choose one. Because I had all the ingredients on hand, this soup seemed like the perfect choice. I did say meatless, but I used the bacon – and I think unless you are really anti-meat the soup is better for bacon. Julie’s recipe is for 8 servings, so I halved it. There is still a lunch or two left in the pot. Trim the leeks, discarding coarse leaves, split lengthways, wash well and chop. Heat the oil in a large pot over a medium heat until hot. Add the bacon. Brown well. Add the leeks, garlic and potato and toss well. Put on a lid, lower the heat and cook gently for about 20 minutes until the leeks are wilted, toss occasionally. Grind on some black pepper, add the water and salt. Bring to a gentle boil, then simmer gently, partially covered, for 45 minutes, until the vegetables are tender. 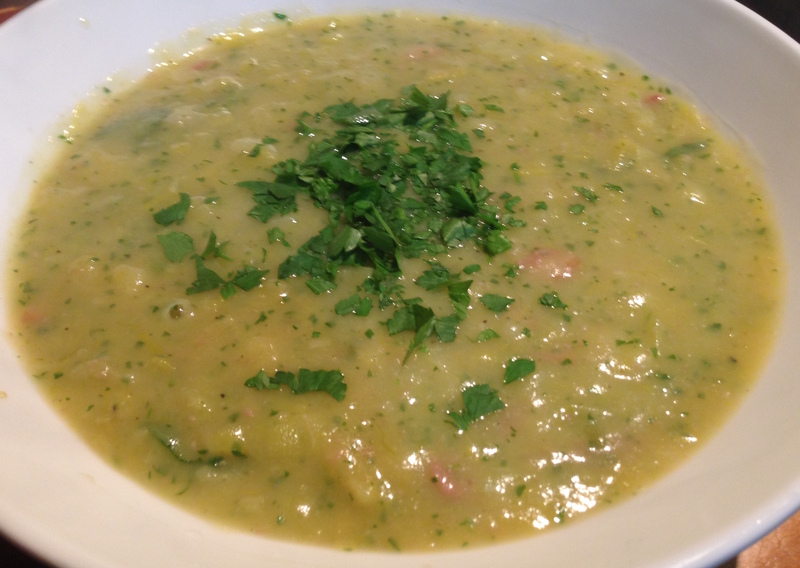 Let the soup cool for 15 minutes, then puree 2/3 of the mixture in a food processor or blender with the parsley. Mix with the unblended soup. Reheat until boiling, add the mint, then serve garnished with a little more chopped parsley. Don’t leave out the mint – it provides a really interesting taste.